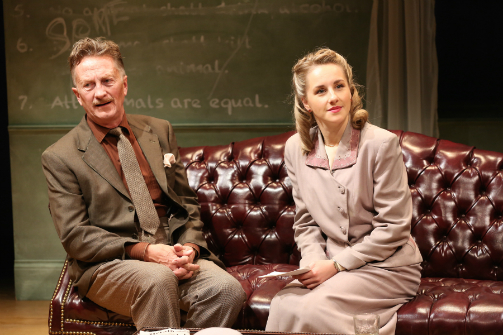 Jamie Horton and Jeanna De Waal in Orwell In America. Photo by Carol Rosegg. BOTTOM LINE: A rare, honest look at the man behind Animal Farm through playwright Joe Sutton's fictional account of what might have happened had George Orwell visited America. A name on a dust jacket sometimes creates a certain mystique for the man behind the name, especially a name like Orwell, which has become a by-word and encompasses certain points of view. However, in Orwell in America, we get to see the author behind the dust jacket, as well as his philosophy, political beliefs, and his vulnerability, on an imaginary book tour in America. “I’m writing about anything that’s happening,” says Orwell in Joe Sutton’s timely exploration of the man who brought the world Animal Farm (and later, 1984). The play is set in the sitting room of George Orwell (Jamie Horton)’s temporary lodging during the tour, where he prepares his talk with his chaperone, Carlotta Morrison (Jeanna De Waal). We see Orwell, revealing his birth name to be Eric Blair, become taken by his beautiful chaperone and ask the latter to marry him upon their meeting. Sutton’s writing as well as Horton’s portrayal certainly brings to life a vivid character. The other major part of the play is set in the auditorium where Orwell gives his talks: a simple lighting change shifts the two realities back and forth. The initial attraction between Orwell/Blair and Morrison soon turns into something else. Of course, for Morrison it’s nothing beyond literary admiration and the kind of awe you have for a personal hero. That respectfully amicable, yet distant politeness soon is mixed with conflicts. It is Blair’s intention to clarify his political beliefs as a socialist, as well as point out the danger of confusing communism with socialism. Animal Farm, after all, is an allegorical tale of the failure of totalitarianism. The novel is famously a satire of the fall of the USSR, and the two leader pigs, Napoleon and Snowball, are based on Stalin and Trotsky, respectively. The power struggles between the animals in the story marks the downfall of Animalism, Orwell’s fictional version of communism. On the other hand, Morrison tries every tactic to dissuade Blair from announcing himself as a socialist, or describing the book as a testament of the virtue of socialism—her reasoning being, in post-WWII America, where "socialism = communism" is still the common mentality, it would be ill-advised to try to change minds overnight. As the evening proceeds, the audience’s reception of Blair’s talk is a mixed bag: some are curiously suspicious; some are awestruck; some are hostile to Blair’s whole concept of socialism as a solution to the problems of post-war society, or a construct that can co-exist with capitalism in a society. Director Peter Hackett makes excellent use of the objects on set to make the transition between "Blair’s residence" and "on stage" clear and effortless. One of the most memorable moments of the play is when Blair explains the kind of poverty Britain had endured with rationing, which began during WWI and continued till after WWII. He takes out items from a grocery bag and lays them out: on one side, rationing in America, which sees individuals receive a limited amount of goods and provisions; on the other side, rationing in Britain for the last almost three decades—an abysmal amount compared to its American counterpart. With such a striking visual aid, Blair continues to explain how the European and American mentalities differ when it comes to understanding the danger of communism as well as the distinction between communism and socialism. Another noteworthy element: during the intermission, stagehands write on the wall seven of the Animalism commandments from the novel, including "All animals are equal." After the short break, Blair comes back to talk about his famous book. As he explains the deterioration of Animalism, caused by its leaders' greed, each of the commandments is wiped off, until the very last one, "All animals are equal," which is (as in the novel) eventually changed into “Some animals are more equal than others." The danger of a hierarchical political system is revealed in stark clarity, and the dispute between Blair and Morrison eventually evolves into mutual respect and understanding. They finally begin to truly listen to one another and treat each other as equals. Playwright Sutton clearly sees the importance of the American audience gaining a deeper insight into Orwell’s extremely time specific "fairy tale." Soundbites of audience members' questions during Blair's talk become slightly off-putting because of the technical capacity of the space. However, it is apparent how they push the story forward. The actors command the stage with captivating grace, especially Horton, who creates a spot-on, complex George Orwell who is no longer merely a name on a dust jacket, but a multidimensional human. Orwell/Blair wrote Animal Farm as an allegorical but nevertheless direct response to what was happening in Europe in the immediate post-WWII era. It ridicules and warns against the evils of both communism and capitalism. However, in 21st-century America, the essence of Animal Farm and the questions Sutton raises in Orwell in America are hitting ever closer to home. When Bernie Sanders’ stance on democratic socialism is attracting youth support, and our society is tense over the prospect of an Orwellian tyrant as our leader, it is everyone’s responsibility to understand that nothing is black and white in politics, and to always think twice before making hasty decisions. Orwell In America is by Joe Sutton. Directed by Peter Hackett. Lighting Design is by Stuart Duke. Costume Design is by Amy Sutton. Set Design is by Caite Heuner. Sound Design is by Ben Montmagny. Production Stage Manager is Whitney M. Heeter. Assistant Stage Manager is Lela Gannon. The cast is Jamie Horton, Jeanna De Waal, and Casey Predovic.